The tale of how the CIA, the U.S. Navy, and America’s most eccentric mogul worked to steal the nuclear-armed Soviet submarine K-129 from the bottom of the Pacific Ocean. It’s a complicated affair, but Dean relates it simply and completely. From undersea searches to maritime architecture to spy agency intrigue, the author excels at making complex operations understandable to the layman. The story’s level of detail is impressive. We learn the major players in the undertaking, how they work together and what skills they bring to the endeavor … The Taking of K-129 is a worthwhile addition to the shelves of military history buffs, nautical enthusiasts and anyone who enjoys a well-told story. ...an absorbing, suspenseful chronicle of a remarkable Cold War episode … The Taking of K-129 is admirably thorough in its research. Mr. Dean, a longtime magazine journalist, clearly loves technology, and he is quite good at describing it. He is also deft at detailing how government agencies interacted with one another and with the private sector … Was Project Azorian worth the money spent and the incredible work that went into it? Mr. Dean thinks it was. Josh Dean has masterfully unspooled a Cold War story of derring-do, spycraft, and deception reminiscent of the novels of John Le Carré. It’s an incredible tale … The Taking of K-129 sets a high bar for nonfiction books about the interplay of government secrecy and maritime engineering. Occasionally, Dean offers the reader too much technological detail, but this is a modest criticism. Now that Soviet submarines are again on the prowl in the ocean lanes of digital global communication, Dean’s book is a refreshing and instructive retrospective on how the Cold War of the past continues to influence the Cold War of the present. 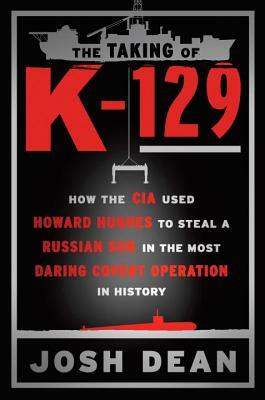 What did you think of The Taking of K-129: How the CIA Used Howard Hughes to Steal a Russian Sub in the Most Daring Covert Operation in History?